2019 Fantasy Baseball Kits available now. 2019 Fantasy Football Kits available in June. Fantasy Baseball kits are now available in store! Get notifications of sale events on our new Facebook & Twitter pages. Here are a couple of products that we have in our store! We never make you search for discount codes. We list them here and are always available. Click here to browse our store. Thank you for visiting our website. 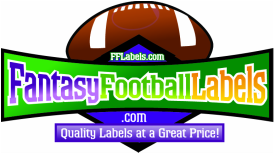 If you have any questions contact us at: Support@FantasyFootballLabels.com (This supports both football and baseball products). Being a small business we appreciate your interest in our products. Thank you! We have been selling Fantasy Label Kits here on the web and also on Amazon and eBay for 14 years. We have had thousands satisfied customers and are always looking to make our product better & keep our prices low as possible.